ERA – The date of the last distillation is critically important. As with most manufacturing businesses, fashions and processes change. Mechanization brought increased consistency to the process, while expansion of the railways sponsored the construction of much bigger distilleries. LOCALITY – Neighboring distilleries may have used similar sources of water, barley and yeast. They may have shared expertise that still survives today in working distilleries. WATER – A core ingredient used to make the spirit and also to dilute the product to bottling strength. Was the water soft or hard? What was the mineral content? BARLEY – The most important aspect of the barley is the phenolic content. Where was the barley grown? Was it local? Which strains of barley were used? How consistent was the yield? YEAST – Why is some sourdough bread better than others? Why do some bakers retain a starter dough for decades? Yeast matters in the process and ultimately has an impact on the final product. PEAT – Was the malted barley peated or unpeated? How much peat was used and was it sourced locally? How did this translate to the phenol content of the finished product? MASH TUN – What material was it constructed from? Was it open or closed, and how was the temperature controlled? Volatile temperatures would inhibit yeast activity. WASH BACK – These would have been made almost exclusively from Douglas Fir; chosen for its straight grain and lack of knots. While some distilleries still use these, most have converted to stainless steel versions that impart no character to the product. STILL – The shape and size of the still deeply influence the overall character of the spirit. For example, a smaller dumpy still will typically allow more contact between the copper and the spirit meaning that it produces a heavier, more viscous spirit. WOOD – After production, what type of wood was used to store or transport the whisky to its destination? Did this have an impact on the final flavor? What did the barrel have in it before it was used for whisky? 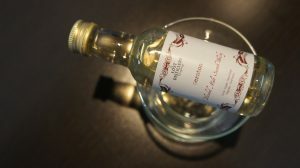 This would have had a significant effect on the whisky’s taste. Their archive team led by professor Michael Moss of the Glasgow University pours through every bit of information they can glean before they recreate each distilleries style. 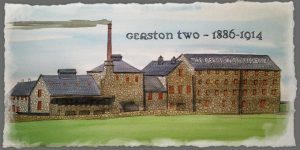 Gerston one was a popular distillery that operated between 1796 and 1882. Small scale with pristine water and briny peat Gerston one was a much sought after whisky in it’s day. Two tales tell of the disaster that ended the distilleries life. One a farmer dredging too close to the well and causing it to dry up and the other a planned expansion to the distillery causing the flow of the nearby spring to divert away. Either of these events meant the end for Gerston 1. Gerston 2 was built in 1886 and lasted until 1914. Much more industrial in scale Gerston 2 did not source the same quality of ingredients as its smaller brother and the spirit never achieved the same level of popularity. Lost Distillery Company Gerston Blended Malt – 46% non chill filtered with no caramel coloring. Aged in American ex bourbon casks. Color: Freshly cut golden hay bails. Nose: Malty ripe raisins and a touch of sea salted caramel with wisp of smoke. Palate: Salty, earthy and sweet all at the same time. Sprinkled mesquite ashes and a medicinal quality that only just sneaks in with softer honey comb making up the sweet base. Finish: Long and persistently smoky but soft and round with a chocolate note. Lets all head over and see what Whiskylassie thought of this excellent Gerston. On this day in the second edition we had another recreation of sorts with the fantastically valued A.D. Rattray Bank Note. As the lone Blended Scotch expression in the second edition the Bank Note has proven to be really popular as a delicious every day drinker at an affordable price. Tomorrow we head to Speyside for another fine cask from the good people at A.D. Rattray.